Some say, "Only Paris is worthy of Rome; only Rome is worthy of Paris." At Monograms, we don’t agree entirely, because we think London is worthy of both! That’s why we’ve put together a vacation package with all three-Rome, Paris, and London. In fact, on this travel package, we've arranged your hotel reservations in all three cities, daily breakfast, sightseeing, transportation between cities, and transfers from/to your hotel to/from the train stations. Plus, a one-of-a-kind feature is the Monograms Local Host®, someone who is on hand throughout your stay to answer questions, arrange your activities, offer suggestions, and help maximize your vacation time. 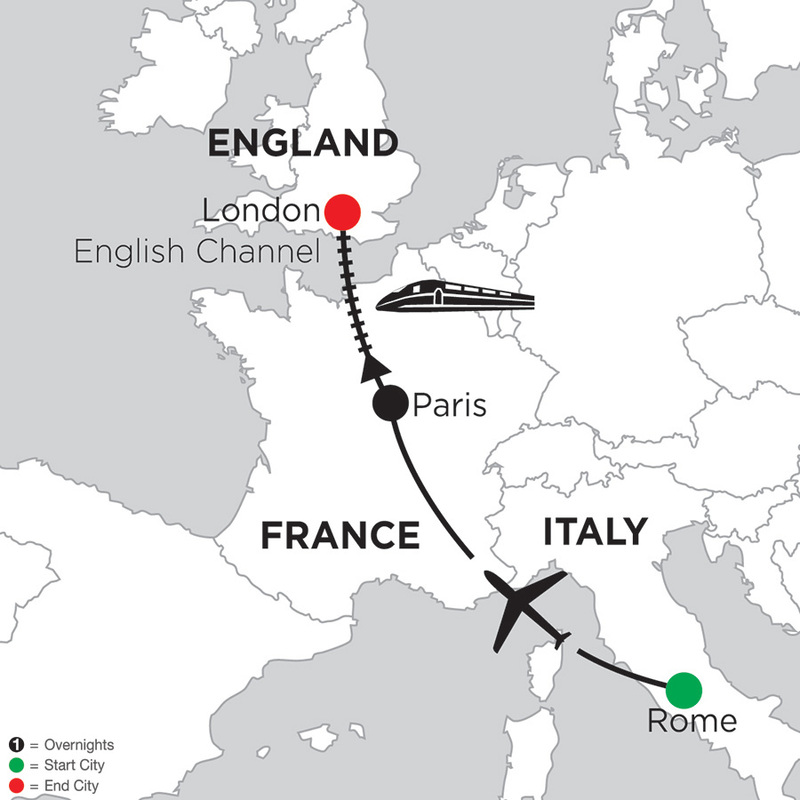 We've arranged for you to have a Local Host in Rome, Paris, and London. Your vacation package begins the moment you arrive in Rome, where we can pick you up at the airport and seamlessly whisk you to your selected hotel. Here, your Local Host will greet you with a warm welcome, help you get settled, and present you with a set of materials to familiarize you with the city. In fact, in each city-Rome, Paris, & London-your Local Host will meet you on your first day, help you get settled, and give you a Destination Guide full of useful information on the city. In each city, we've also arranged sightseeing with a local expert. Hear the inside stores about the must-see attractions and learn little-known secrets as you see each city’s famous landmarks. 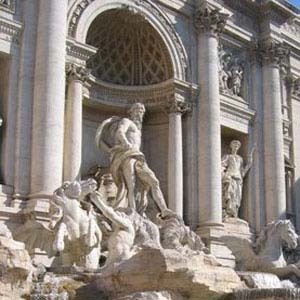 In Rome, your sightseeing includes the Vatican Museums, where you’ll see its amazing treasures; the Sistine Chapel, where you’ll view Michelangelo's The Last Judgment and his famous ceiling paintings; St. Peter's Square and Basilica, built in 313 AD; the iconic Colosseum, famous for its gladiator fights; and the Roman Forum, where you’ll see the oldest structures of the ancient city. In addition to famous sights such as the Arc de Triomphe, your Paris sightseeing tour features Notre Dame Cathedral, dating back to 1163, and a Seine River cruise, a beautiful way to see Paris. In London, see Big Ben and Westminster Abbey, where Prince William and Kate Middleton were married, and visit St. Paul's Cathedral, where you'll hear the fascinating history of this iconic cathedral. We’ll also take you to see the Changing of the Guard at Buckingham Palace. And never fear...the inside visits included in your Monograms vacation include VIP access, which means you get to skip the lines! After all, why wait in line with all the other tourists when you can be up close and personal with the attractions? In Rome alone, that will save you over four hours of vacation time! In each city, you'll have time to explore on your own (with the support of your Local Host, of course). You may want to shop at the famous department stores, such as Harrods and Selfridges in London; at the designer Italian boutiques along Rome’s Via Conditti; or at the Galeries Lafayette in Paris, where we’ve secured shopping discounts for you. Perhaps take an excursion from Rome to Tivoli, where Hadrian built his villa at the peak of the Roman Empire; to the Palace of Versailles from Paris; and to mysterious Stonehenge near London. The possibilities in each city are endless! And did we mention your Monograms travel package includes transportation between the cities? We've included your seat on the high-speed Eurostar train from Paris to London. We've even included transfers from your Rome hotel to the airport, from the Paris airport to your hotel, from your Paris hotel to the train station, and from the London train station to your selected hotel. With the transportation and transfers we've included, the sightseeing and guides we’ve arranged, and the hotels we've booked, you just have to remember your camera! Add the comfort of knowing you’ll have Local Host for you throughout your stay, and it's a vacation of a lifetime.